Sterling experienced it’s most volatile day of trading since the aftermath of the EU referendum in July 2016 on Thursday, with the resignation of Dominic Raab and parliamentary disagreements on the draft Brexit text causing chaos within the UK government. 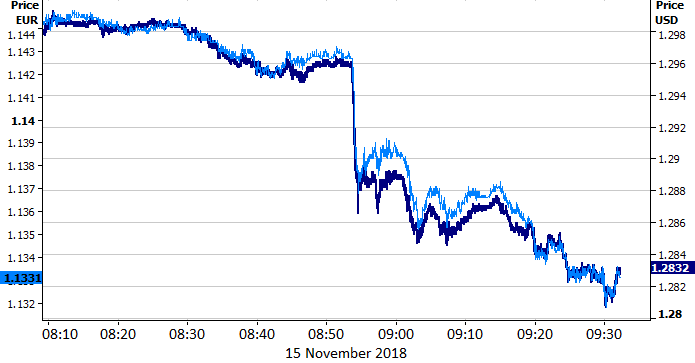 he resignation of Raab, who had replaced David Davis in the post of Brexit minister back in July, sparked a collapse in Sterling against all of its major peers at around 9am yesterday morning. The UK currency sank by over one-and-a-half percent against the US Dollar and by over one percent versus the Euro as investors began to fret over the chances of May’s draft agreement being passed in a government vote. These concerns amplified as trading progressed with Labour MP’s, members of the DUP and a host of Tory ministers voicing their displeasure over the draft agreement, mostly regarding plans for the Irish border post-Brexit. The resignation of Work and Pensions Secretary Esther McVey and two other junior ministers didn’t help the Pound. The calling of a vote of no confidence in May from a number of MP’s, notably the outspoken backbencher Jacob Rees-Mogg, further clouds the outlook. While we still think that the lack of suitable candidate to replace May means that her ousting is unlikely, it’s not clear what level of support she can gather ahead of the next EU summit on 25th November. It is worth noting that the motion would require 48 signatures in order to trigger a confidence vote and it is as yet unclear as to how close they are to this number. 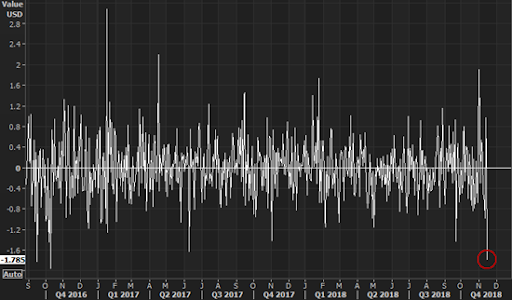 As for the magnitude of the Pound’s decline, yesterday’s fall in Sterling was the currency’s largest daily drop versus the US Dollar since October 2016 (Figure 2) and the most it has fallen versus the Euro since November. 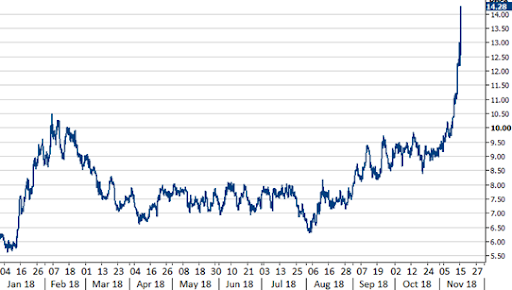 Volatility in the GBP/USD cross, indicated by the gauge of one month implied volatility, also spiked to above 14%, its highest level since July 2016 and a mere couple of weeks after the shock referendum result (Figure 3). Sterling 6 month risk reversal also declined to its lowest level since September 2016, suggesting that investors are fearful of additional losses for the currency in the coming days. It is now looking increasingly likely that Theresa May’s draft agreement will not garner enough support to pass through a parliament vote in its current form. Negotiations with the EU will continue in an attempt to produce a withdrawal text that would satisfy the UK government. Should this agreement fail to pass in a government vote, the risks of a no-deal Brexit rise sharply. 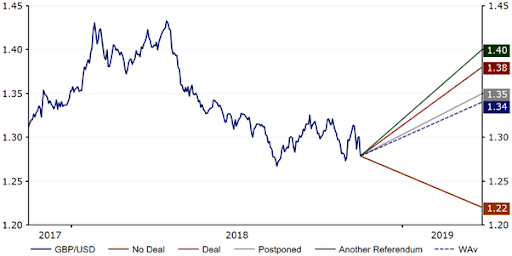 As we have mentioned in the past few months, we believe that this would lead to a sharp decline in the value of the Pound (Figure 4) and could prove a significant net negative for the UK economy. Regardless of what happens in the next few days, the Pound remains highly susceptible to additional wild swings in the exchange rate and we think that additional losses for the currency are likely as long as the ‘no deal’ scenario remains on the table.